As Russian engineers battle to regain control of an ailing Mars moon probe stuck in Earth orbit, the chances of salvaging the spacecraft's ambitious mission appear to be dwindling, according to Russian news reports. Attempts to contact the beleaguered Phobos-Grunt spacecraft overnight Thursday (Nov. 10) have failed, and the spacecraft could fall back to Earth around Dec. 3, a Russian space industry spokesman told the country's Ria Novosti news service. "The spacecraft repeatedly passed over the Baikonur station and other Russian and foreign points of space communications during the night. There is no news yet," the Ria Novosti quoted the unnamed spokesperson as saying. Russia's official Federal Space Agency (Roscosmos) has not posted an update on Phobos-Grunt's status to its website since Nov. 9, one day after the probe launched into space from Baikonur Cosmodrome in Kazakhstan. 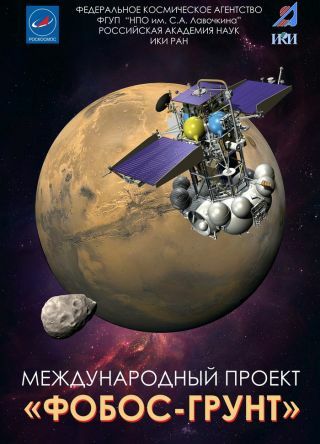 Another Ria Novosti report, translated from its original Russian, suggested that if Phobos-Grunt does fall back to Earth, it would likely not fall over Russia. The spacecraft's orbit carries it between the latitudes of 51.4 degrees north and south of the equator, a region that includes the United States, China, Africa, Japan, Ukraine and parts of southwestern Europe. The mission aimed to land a probe on Phobos, collect samples of the Martian moon and return them to Earth by 2014. The spacecraft is also carrying China's first Mars orbiter, called Yinguo 1, which it was expected to deploy after reaching the Red Planet in 2013. But shortly after the Phobos-Grunt probe separated from its Zenit rocket, its thrusters failed to fire during a critical maneuver needed to begin the journey toward Mars. Since then, Phobos-Grunt has been stranded in Earth orbit as Russian engineers struggle to re-establish control. For now, the spacecraft is most likely stuck in an orbit that ranges between 129 miles (207 kilometers) and 216 miles (347 km) above Earth, said Brian Weeden, a technical adviser for the nonprofit Secure World Foundation dedicated to the sustainable use of space. For comparison, the International Space Station flies in orbit about 245 miles (394 km) above the planet. Phobos-Grunt is a massive spacecraft that weighs nearly 30,000 pounds (13,607 kilograms), of which only 110 pounds (50 kg) is scientific gear. In addition to its Phobos lander and the Yinghuo 1 orbiter, the vehicle includes a small return vehicle and a re-entry capsule to return Phobos samples to Earth. A support frame and a bulbous set of fuel tanks round out the spacecraft. NASA and the U.S. military, which routinely track the more than 200,000 pieces of space junk in orbit today, are keeping a close eye on Russia's Phobos-Grunt vehicle, according to Nicholas Johnson, chief scientist at NASA's Orbital Debris Program. "The U.S. Space Surveillance Network is tracking without difficulty both the Phobos-Grunt spacecraft and its associated Zenit 2 second stage," Johnson told SPACE.com in an email Nov. 10. "This information is also available to Russian experts. NASA hopes that control of the spacecraft can still be achieved and that it can be sent on its proper path to Mars." If the Phobos-Grunt spacecraft does fall to Earth, it would be the third spacecraft to do so in three months. In October, a dead German satellite fell from space over the Bay of Bengal after orbiting Earth for 21 years. In late September, a defunct NASA Earth-observing spacecraft also met a fiery demise by burning up in Earth's atmosphere over the southern Pacific Ocean. SPACE.com Staff Writer Denise Chow (@denisechow) contributed to this report. You can follow SPACE.com Managing Editor Tariq Malik on Twitter @tariqjmalik. Follow SPACE.com for the latest in space science and exploration news on Twitter @Spacedotcom and on Facebook.